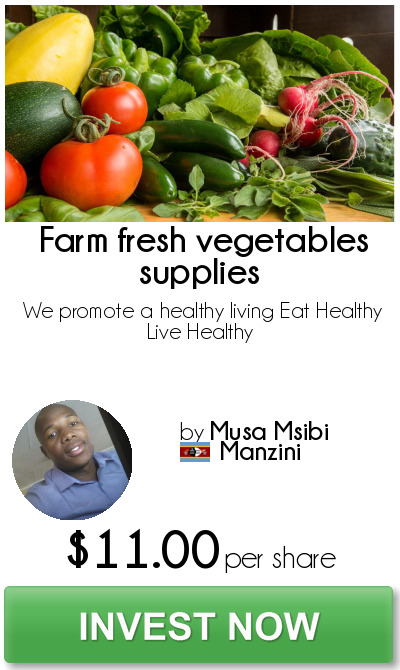 We are a team of professional farmers who specialise in growing and supplying vegetables. We believe that vegetables are esential for our everyday living. This small business started in 2017 on a small piece of land and we have been making good progress since we were able to achieve 460% returns. A lot of customers have been attracted by our fresh products and good service which makes our services to be moree in demand. As the demand gets higher, we need more hands and more land to increase our harvest. The biggest challenge that we are faced with so far is insufficient funds. Our plan is to buy more land and provide employment to people who are going help us in our garden. Clients are our first priorityy, we aim at providing the best customer services at all times, so we need a second delivery van so that our customers get assisted instantly without any delay. We plan to accelerate the market sales through massive online advertising, flyers, etc. - Customers are the bloodline of the company, so our first objective is to keep the best customer service. -To implement a good marketing strategy to attract new buyers and introduce new items that will allow us to up-sell to our existing customers. The total number of shares, which this project is authorized to issue is six thousand nine hundred and thirty-seven (6,937), each with a par value of $2.00 USD.